Good morning to everyone, I wish you all a great week. A little info of what’s happening right now and some fun I had during the weekend. In Miami there is “The original Miami Beach Antique Show” And today feb 6th is the last day. It’s really worth going to check it out if you are into antiques, great stuff and maybe you get to catch a good deal since is the last day! And also very exiting, the premier of the movie ““The hidden Face”. Very good and the story is totally unexpected. Buenos días a todos, les deseo una semana fantástica. Aquí les paso información de lo que esta pasando ahora mismo y en lo que me entretuve el fin de semana. En Miami esta ““El Show de antigüedades” y hoy febrero 6 es el ultimo día. la verdad vale la pena darse una pasada si les gustan las antigüedades, cosas muy lindas y hasta de pronto agarran alguna buena oferta por ser el ultimo día! Y también fue la premier de la película “La cara oculta” Una historia muy buena totalmente inesperada. 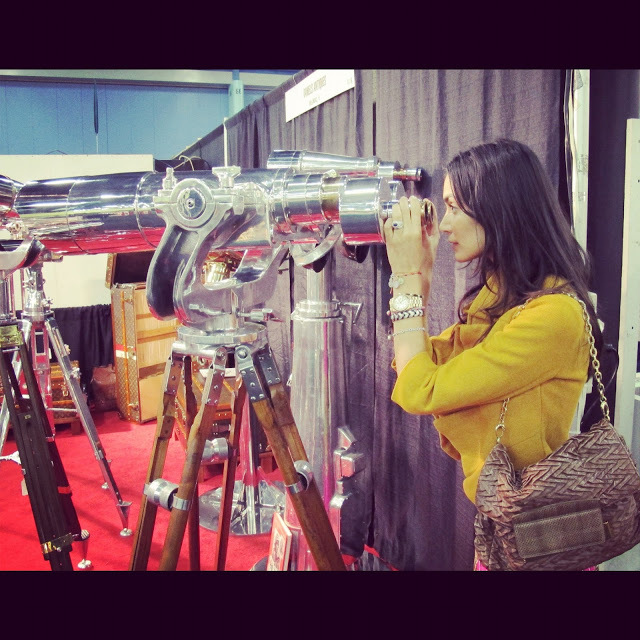 I went to the antique show with my friend Marcela Mar, we were checking out this cool booth with vintage sunglasses. Fui al show de antiguedades con mi amiga Marcela Mar, estabamos encantadas con este puesto de gafas vintage. My Jewelry obsession…I fell in love with this victorian sliders bracelets. Y yo con mi obsesion por la joyas… Me enamore de de estas pulseras victorianas. Estabamos admirando las joyas que ella estaba usando. Friday was the premier in USA of the movie “The Hidden Face” where my friend Marcela Mar had a participation, so we went watch it. Really good and I highly recommend it. Let’s support the Colombian film industry! El viernes fue la premier de la peli “La cara oculta” donde mi amiga Marcela Mar tuvo una participación y fui a verla con ella. Muy buena, súper recomendada. Apoyemos la industria cinematográfica Colombiana! I loved the necklace Marcela was wearing that night made of swarovski crystals kind of like a smoky gray color. Me encanto el collar que Marcela uso esa noche de cristales de swarovski como de un color gris ahumado.